French President Emmanuel Macron is in Ethiopia for a two days official visit which came days after tragic Ethiopian Airlines plane crash in Bishoftu (Debre Zeit), about 42 kilometers, southeast of the capital Addis Ababa. As Ethiopia is mourning 157 victims of Ethiopian Airlines plane crash, who happened to be from about 35 countries in the world including France, French President Emmanuel Macron arrived on Tuesday in Ethiopia for a scheduled two days official visit. Apparently, Macron made a stopover in Djibouti before he made his way to Ethiopia. During his stay in Ethiopia, he is scheduled to meet and hold discussion with Ethiopian President, Sahlework Zewde, who happens to be a fluent French language speaker, and with Prime Minister Abiy Ahmed. Trade, investment and development cooperation are among the issued to be discussed between the leaders. 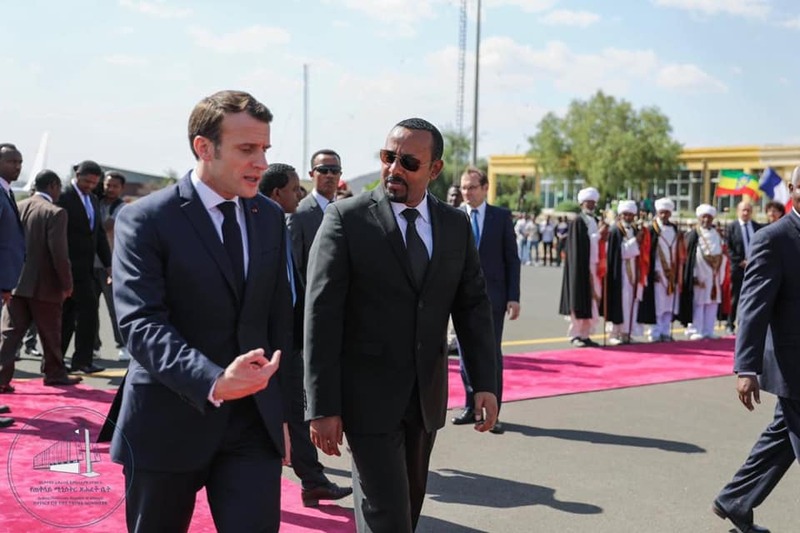 Unlike the case of reception for other leaders, the red-carpet ceremony for the French president rather took place in Ethiopia’s 12th century capital, now UNESCO heritage and an important tourist attraction for the country, Lalibela. Macron’s government pledged to support Ethiopia in its effort to preserve the historic site when prime minister Abiy Ahmed visited Paris in late October 2018. It was at the invitation of French president that Abiy Ahmed visited France in October 2018, as cited above, and it was then Abiy Ahmed extended an invitation for president Emmanuel Macron to visit Ethiopia. The two leaders made a joint deceleration during Prime Minister Abiy’s visit to France and have agreed to cooperate in a range of areas including in defense and security, trade and development and culture, among others. France is one of the countries supporting Prime Minister Abiy Ahmed’s administration reform measures in a range of areas although uncertainty about the reform measures are now emerging due to what seems to be growing ethno-nationalist radicalism within the ethnic party that Prime Minister Abiy is leading-symbolically- Oromo Democratic Party. Some political analysts see considerably high possibility for the reform measure to be reversed as existing ethno-nationalism within Abiy’s party is creating conducive conditions for counter-reform forces, under the leadership of Tigray People’s Liberation Front elites, who are allegedly operating their resistance from Northern parts of the country. Diplomatic relations between France and Ethiopia was established as early as 1897.